In what it claims to be the largest update ever, Microsoft will introduce social results to its search engine -- not unlike the "Search, Plus Your World" initiative Google launched in January. However, instead of showing only Google+ data, Bing will incorporate information from relevant contacts and experts on Facebook, Twitter and more. Coming to the US in a few days, the update will add a "brand new information architecture" with three columns: the left contains familiar algorithmic results, the middle column provides a "snapshot" of relevant information and services such as maps and reviews, while the right "sidebar" has social-oriented results. Microsoft says no matter what people are searching for, they want to "get something done," and research shows that 90% of them consult friends or experts before making decisions. The sidebar aims to accommodate both demands as it lets you interact with people you know as well as industry pros from directly within Bing's results. For instance, you can share your results and ask someone a question on Facebook and they can reply through Facebook or Bing. If you're visiting Seattle, you might as a local friend for recommended eateries. If you're buying a PC, you might seek advice from a tech-savvy buddy. Bing will analyze your query and automatically display the most relevant contacts, making the process as easy as possible. Again, besides showing you friends familiar with whatever you're searching for, Bing will look outside your circle for influential figures relevant to the subject. For example, if you search for Windows 8, you might see activity from Paul Thurrott of SuperSite for Windows. Bing will scour various blogs and social networks for this data, including Blogger, Google Plus, LinkedIn, Quora, Foursquare, Twitter etc. Microsoft promises to keep the sidebar non-intrusive as it's collapsed off to the right by default. The company also noted that it's minding your security and privacy. When you're signed into Facebook using Bing, the search engine will only reveal content your friends could access by viewing your Facebook profile directly. 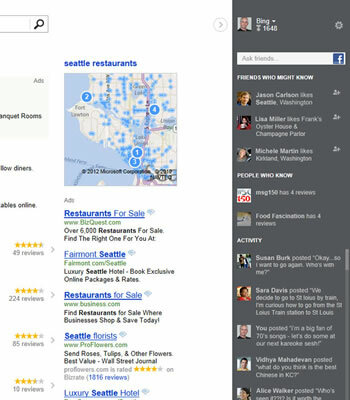 Bing's mobile site will also receive the new social features in the coming weeks.